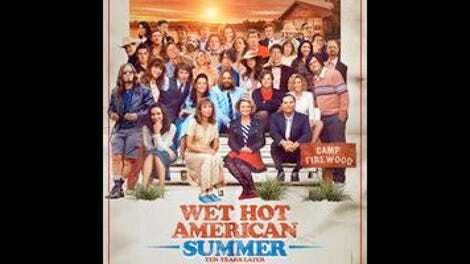 The Wet Hot American Summer Cinematic Universe is crammed tightly with goofy gags and absurd premises, many of which could be spun off into their own series. (I, for one, would enjoy a dark origin story chronicling the genesis of Coop’s superhero alter-ego, Miss Patty Pancakes.) 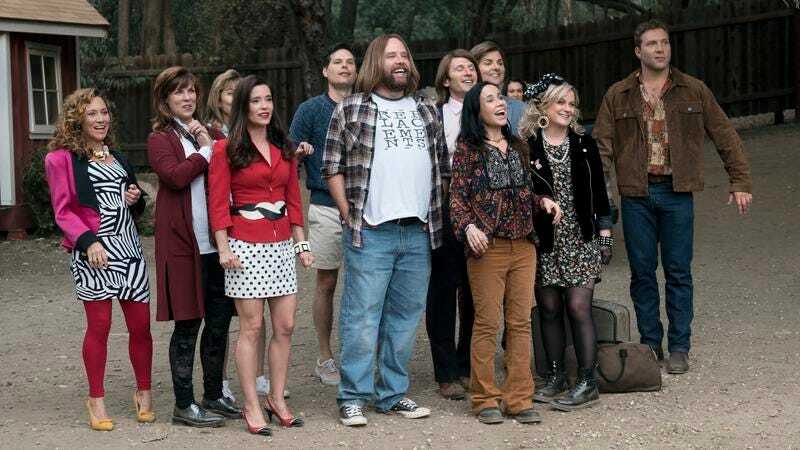 Michael Showalter and David Wain chose a more fertile jumping off point for the second installment of their WHAS serialization, homing in on the scene from the film in which Ben and Susie wistfully suggest the Camp Firewood gang reconvene in a decade. Everyone agrees to return to see what divergent paths their lives have taken since that fateful summer, including McKinley, who wants to make it but might need to iron out a scheduling conflict. Apparently, everything worked out. There’s a slim but real chance that Ten Years Later might be consumed by people unfamiliar with the original film or the prequel series, but just as with First Day Of Camp, the opening episode does what it can to welcome newbies. “Reunion” kicks off with a semi-restaging of the springboard scene, but because this is arguably the most surreal comedy ever, some changes have been made. Thanks to some deliberately conspicuous movie magic, the Camp Firewood crew now includes Mark and Claire (Mark Feuerstein and Sarah Burns), who have been digitally stitched into the original scene. It’s a bold choice even for a show that has little to no interest in mythology or continuity, and I trust the next seven episodes will bear out why Mark and Claire are so important to the story that they warranted such an abrupt introduction. But it probably won’t matter when all is said and done, because Feuerstein and Burns have already made themselves invaluable before “Reunion” has finished the necessary table-setting. Seeing them randomly pop up in the original scene is its own sight gag, but beyond that, Feuerstein and Burns just seem to fit in this world in a way I didn’t expect. Feuerstein is an especially pleasant surprise, perhaps because of my limited exposure to him. I knew Josh Charles would fit into this ensemble in First Day Of Camp, but having only seen Feuerstein in Royal Pains and as a guest star on The West Wing, I wasn’t as prepared for his wide-eyed energy. Adam Scott also joins the cast as the solution to the issue of Bradley Cooper being, like, super busy all the time. Yes, the once-closeted theater queen half of McKinley and Ben is now played by Scott, in what is easily the most defiant actor swap since KFC launched its procession of Colonel Sanderses. But Scott is such a welcome addition to any project that I didn’t spend a moment missing Cooper, especially because by reteaming with Amy Poehler, he’s created the Parks & Recreation mini-reunion I didn’t even know I wanted. The hilarious cover story for Cooper’s absence is just as absurd as the sudden appearance of DJ Ski Mask in First Day. As it turns out, poor Ben had a deviated septum and got a nose job to repair it, so now he looks like Ben Wyatt wearing Will Forte’s MacGruber wig. Of course, 10 years have passed, so far more has changed than basically every aspect of Ben’s face. “Reunion” is, by necessity, a blur of drop-ins as all the characters prepare to head back to Camp Firewood. Coop has blossomed into a promising writer whose work-in-progress memoir needs more of a romantic throughline. Luckily, Katie is also headed back to camp in a rare break from her high-powered job as editor of a Manhattan fashion magazine and is hoping to rekindle her flame with Coop. (If “flame” is the accurate word to describe their relationship, which…probably not.) Beyond that, the updates are in keeping with what we know about the characters. Beth is still counseling, while Gary has climbed up in the culinary world, Lindsay is now a broadcast journalist, and Susie is now a powerful film producer with a passion for dropping names in the fashion once referred to on the interweb as humblebragging. The only person missing from the reunion is Andy, who probably has a plan to roll up on a motorcycle and dismantle all of Coop’s best laid plans for a romantic reunion with Katie. Much like last season, Ten Years Later probably works better as a story if you shotgun the whole thing rather than watching it piecemeal. Showalter and Wain seem acutely aware of this, judging from a scene when the girls catch up in their bunk and Susie talks about a television project as a “long movie.” She repeats the phrase until it sounds as silly as it actually is, taking a not-so-subtle shot at the television creators who seem to think the only way to describe the intensity, quality, or craft of their project is to compare it to a movie. “Reunion” makes the case that a Wet Hot series can indeed work as a binge experience or an occasional drop-in just by gleefully flouting the rules. If Mark, Claire, and Nose-Job Ben can drop in unannounced, why shouldn’t anyone else? As always, there’s a cataclysmic threat facing Camp Firewood, this time related to a scary-looking military bunker situated underneath the camp. This property must have sold for an uncommonly low price per acre. I can’t properly express how much joy I got from Ben and Susie’s reunion, when she tells him the correction of his deviated septum is her only concern. Victor still hasn’t gotten laid. That plotline needs some follow-up this time around. I’m really interested to see how Alyssa Milano fits into this group. Seems like the character is demanding her to hold back initially, but I can’t wait to see what she does. Katie has a flashback to auditioning to “Heart Attack Love,” marking the return of Craig Wedren’s awesome, period appropriate compositions. Assuming he followed the same formula, I can’t wait to see what he does with the sound of ‘90s radio. It’s the ‘90s, by the way, and you know that because Amy Tan’s The Kitchen God’s Wife just came out.